Big changes are on their way, come June! That's right, back in September we began the early stages of one of our biggest projects yet and in another 20 weeks, we'll be ready to share the big reveal — our newest family member. Our sweet news is also one of the reasons moving a laundry nook upstairs shot straight to the top of our list of house projects. With that, we're not only gearing up to complete the office & laundry space, but have added a nursery (!!) to the list of rooms we'll take on in the coming months. On one hand, I'm feeling all of the first time mom excitement and jitters. On the other, I feel so much comfort in knowing that it's not Tim's first time and just how much love there will be to go around with Stephanie and Brandon. 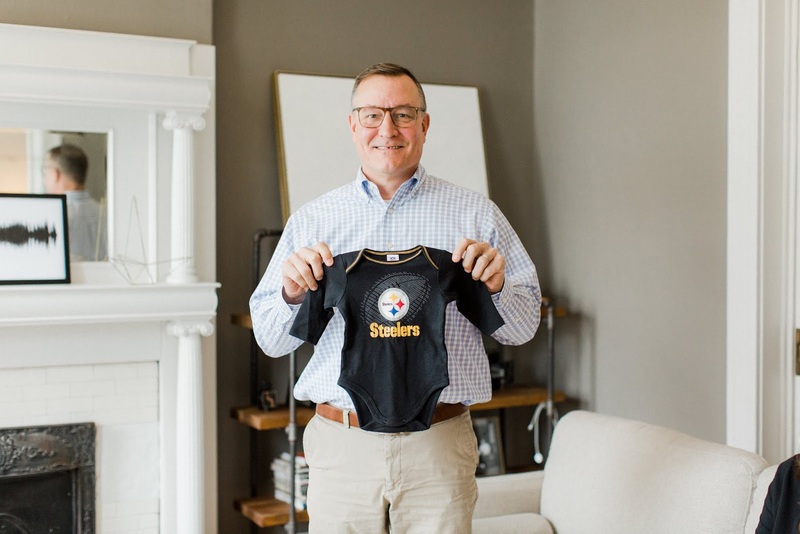 In fact, one of our very first baby gifts was a Steelers onesie from Stephanie and her husband over Christmas (#herewego). Tim's been joking that after marrying one off, he's getting back in the game. We shared the good news with family over Thanksgiving and one of the happiest parts has been seeing the excitement everyone feels right along with us. As for Basil, he keeps trying to understand what we mean by "a big surprise" is on the way. In all of our excitement to share this announcement, I'd be remiss to gloss over the fact that our story doesn't come without challenge, waiting and loss. That said, I've also come to learn that the things I hold dearest usually come from places or times where I deeply understood what it meant to be without. A few weeks back, I mentioned feeling ready to begin opening up about navigating a more personal journey after receiving a diagnosis of unexplained infertility 2 years ago. 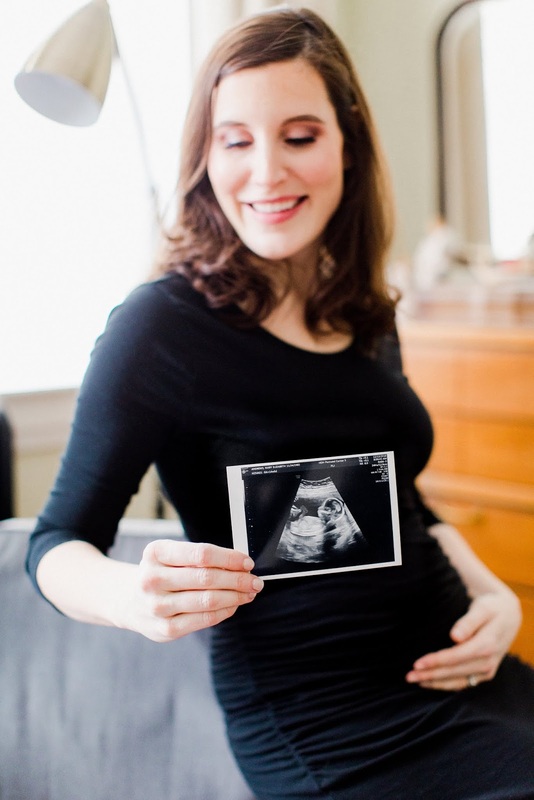 And while I sit here now 20 weeks into pregnancy, it still feels important to talk about. It was other women who were willing to share about their struggles, either in person or through the internet, that gave me comfort and strength in knowing I wasn't alone — and that there is hope in every outcome involving infertility. I have a strong belief in the power of community, and while the right process for me was silence while we navigated uncharted waters — as the fog begins to clear, I want to talk about it more and add my voice to those that I found so much comfort in when it was too difficult before. For mothers reading today that may have a similar experience or are still in the midst of your journey of waiting — I see you, and I'm thinking about you. 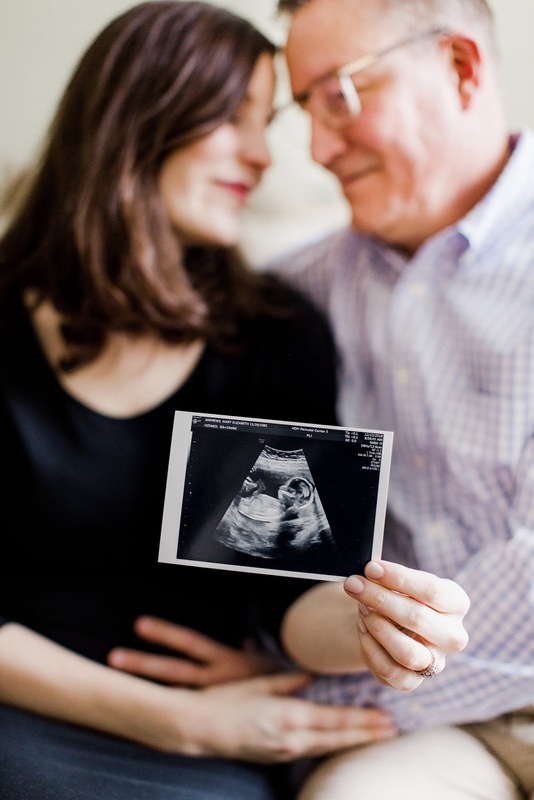 In the midst of our more regular home and life updates, I'm thinking I'd like to write a small series of posts that talk about my initial diagnosis, all the way through our experience with in vitro fertilization, which ultimately ended up being the right answer for us. If you're curious about certain topics or have thoughts to share from your own experience, I'd love to hear from you in the comments below. In the meantime, thank you for taking the time to share in our good news today and as always, for making this a safe space to share the special moments in our lives. 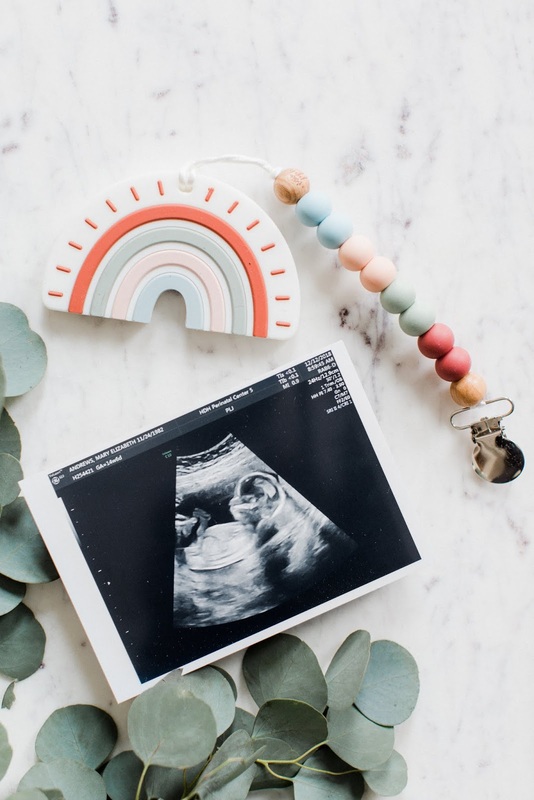 I'll be over here researching all the little things we need to know and have for Baby Vidra — welcoming all your pregnancy favorites and new baby must-have lists along the way! 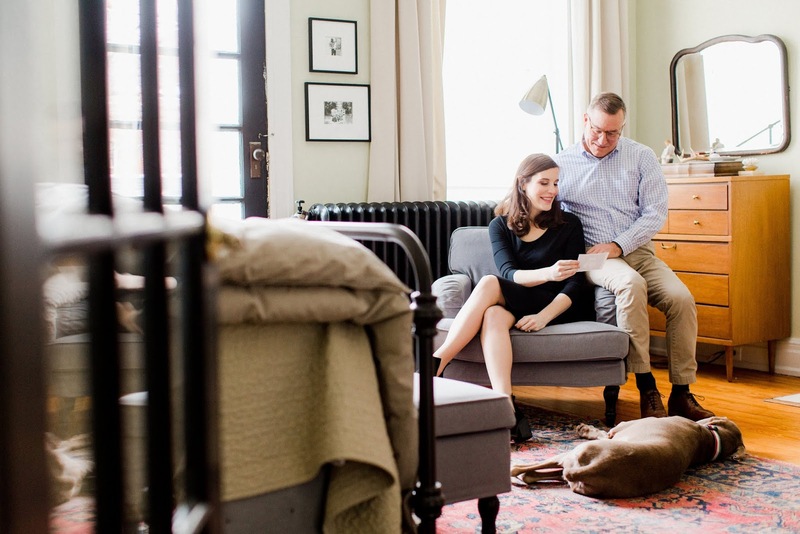 Each of the photographs in today's post were captured by our talented friend and photographer, Ali Williamson of Alisandra Photography. We are so grateful for a friend like Ali who has not only shared in our life but captured so many special moments like these that we will be able to cherish for a lifetime. Congrats on your wonderful news! I welcomed my second IVF baby June 4 of this year =) Infertility is a roller coaster but it has made me a stronger, kinder and more empathetic person and I think a better mom. I am sorry you had to experience this, but it sounds like you might agree on some of those emotions. Hope you're feeling well. Sara, congrats on your recent addition — isn't it a miracle? Thank you so much for sharing — I do feel the same about this particular kind of journey making us stronger and more empathetic. I wouldn't wish being a member of this club for anyone but couldn't agree more that I am 100 times more grateful for what we have to look forward to because of it. Hugs! Congrats!!! IMy journey ended without a baby but I have come to accept that with time and more grateful with what I do have. I was diagnosed with unexplained infertility when I was 37. We did five rounds of IUIs with no pregnancy. We then did IVF with my eggs that resulted in no pregnancy. My husband and I then re-grouped when I was 40 (two years off due to a car accident and two years of physical therapy. )and decided we would have better chances using an egg donor which we did and got pregnant. I had a miscarriage at 7 weeks and it broke me. After a long bout of depression, we re-grouped again when I was 42 and did it again and I got pregnant again. 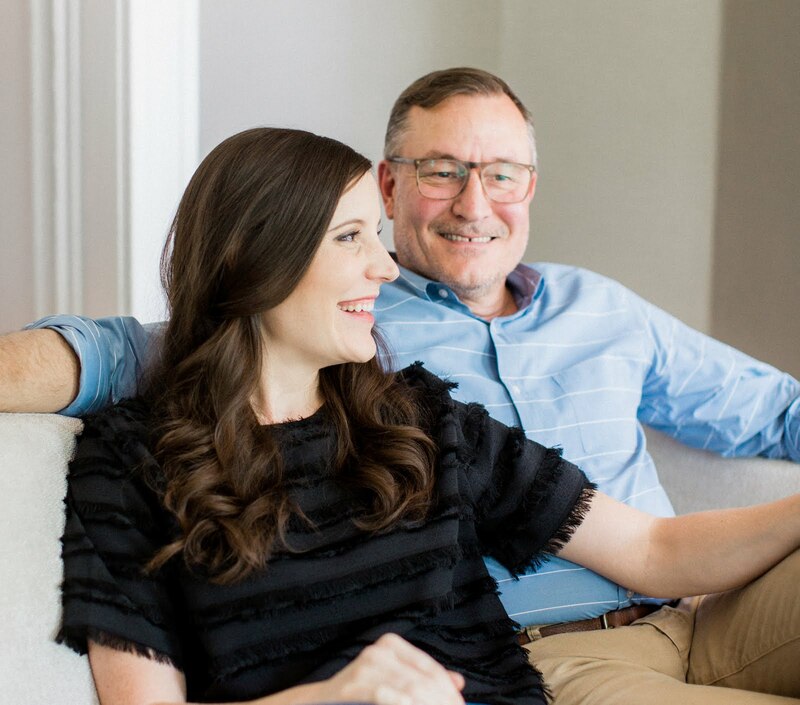 I then lost that one at 9 weeks and then at 12 weeks, my husband rushed me to the hospital to learn that I had another one in my fallopian tube that the fertility clinic didn't catch. After emergency surgery, losing a fallopian tube, losing 50% of the blood in my body (yes, you read that right), a blood transfusion the next morning, I am here to say that I am so grateful to be alive. My doctors thought I would die in the night. I struggled for 8 years trying to have a child and at the end of it and now at 45, I can say I am okay. I would have done IVF again, but my husband said he couldn't lose me and sometimes that has to be enough. It always bothered me when I was trying to conceive that no one ever talked about their problems with fertility or if they did end up getting pregnant, they just wanted to forget that it every happened. My journey was long, but I am a stronger, more grateful person than I was before and maybe that is how it was supposed to be for me. Thank you for sharing some of your story and that you are having a baby! The best of luck to you all! I couldn't agree more about setting a personal threshold for when your "enough" is. One of the very hardest parts about navigating unexplained infertility in my experience was how there was never a "finality" in an answer — there was always a next step or one more try available. I always felt like if a Dr. could just give me a concrete reason, I could accept it. A good friend once told me exactly what I needed to hear, in that "whatever you decide, you are making the right decision." Our journey ended in pregnancy much sooner in the process than yours and I am in utter admiration of your strength. Thank you for taking the time to share your story and celebrate with us! Congratulations Mary and Tim! I've been following for many years, and it's so funny that I now find myself in a very similar situation to yours! My partner is 17 years older than me (30-47), and he has an 11 year old. 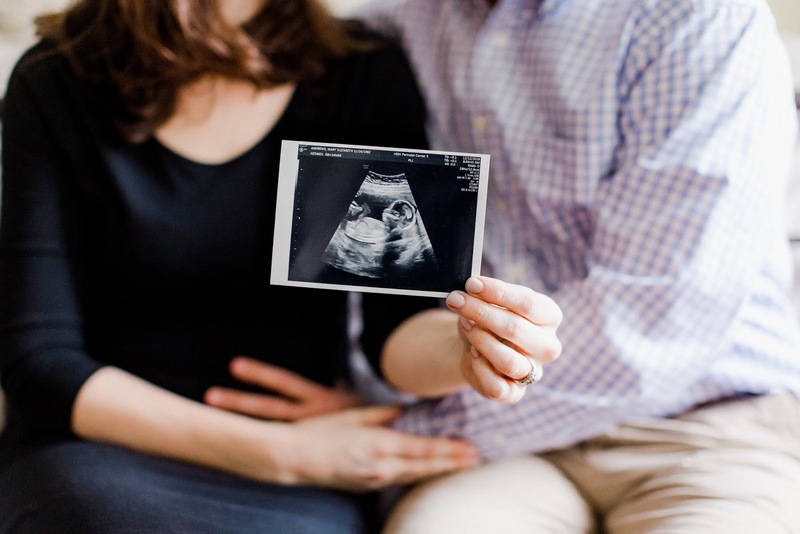 I too have infertility issues (PCOS), and there's a lot to navigate with both of us being older and with him having a child from a previous relationship. I personally would LOVE to hear your thoughts and experiences (from both of you) on having another child later in life, getting pregnant with infertility, how you navigate starting a family in this situation (although I know you've been together a long time and are very close to Tim's kids). For us, it's much newer, so any insight on that would be truly helpful. Best wishes on your wonderful news! Kate, I'm thrilled to hear your life is so full — isn't it amazing how the world works like that? Thanks for being so open on the areas you'd like to hear more about from us, it's encouraging! I have learned a lot about PCOS and from those that have it that are navigating an infertility journey and I fee for you! Hang in there, Momma! Congratulations to you both!! I'm happy and excited for you. It will definitely be an adjustment but having a child and being a parent can bring such immeasurable joy! Thanks for the encouragement, Nancy! We're over the moon! Congratulations!! Such exciting news! Look forward to hearing your journey. We’re in our fourth round of IVF and are hoping for our miracle. This is our last go at it so fingers crossed! Sending you the biggest, brightest hugs, Nicole! It took 3 transfers before this baby on the way made it clear they were sticking around. It was also the threshold we'd come to decide would be our last try before being at peace with any outcome. I will be thinking about you and hoping you find peace in this step of your journey. Thank you so much for your kind words and stopping in to share a piece of your story with us!